Now, before you run to fire off a rebuttal to me, listen for a second. I am not suggesting we need to hate ourselves. Not at all. But the truth is, what the Bible holds up as a big problem, our culture has embraced as a golden solution to nearly every social ill. Google “self-esteem” or “loving yourself” and browse some of the millions of selections that come up. Take a walk through the “self-help” aisle at your local bookstore and read some of the titles that promise to teach you more effective ways to love yourself, to make yourself happy, to ensure you “look out for number one.” It’s a popular theme in music, as in Whitney Houston’s smash hit, “The Greatest Love of All.” Some of the lyrics include, “Because the greatest love of all is happening to me. I found the greatest love of all inside of me … Learning to love yourself, it is the greatest love of all.” A blogger wrote this about Houston’s song: “Forgive me, but I have the greatest video montage of all in my mind for this. It would include a series of images representative of what is being spelled out here. First you would see a man in a field with his arms wrapped around himself, dancing and leaping for joy. Then you would see a man in a straight jacket embracing himself in a mental institution. Then the scene would shift to a woman holding flowers, boldly proclaiming that she bought flowers for herself because she deemed herself more than worthy. The video then would conclude with a recent news story about a woman who recently proposed to and married herself with many emotional onlookers” (Man in the Woods). That’s the answer. 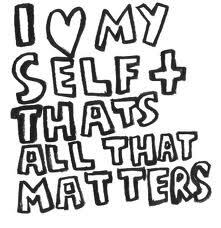 The opposite of self-hatred is not self-love. It is love for God, which produces a healthy love for others. The solution cannot be found “within us.” It can only be found outside of us, the creature, and in him, the Creator.